Cause of his death was Inflamation of the bowels. Herbert was baptised by George Quilter. Qualified as a Solicitor, he practiced with his brother Edric in Maidstone and Holt Norfolk. They then both left to join their brother Reginald in New Zealand. A Herbert Julius aged 29 arrived in Victoria April 1858 aboard the Essex from Britain. H. Julius departed Melbourne 4 June 1859 for NZ on the ship "Pirate", he is described as a single Gent aged 30 yrs. Arrived 16 Jun 1859. Herbert is registered on the NZ Electoral Rolls, 1865/66 to 1867/68 the electorates varied between Hampden, Lindis and Oamaru, his address was Rugged Ridge, Waitaki. 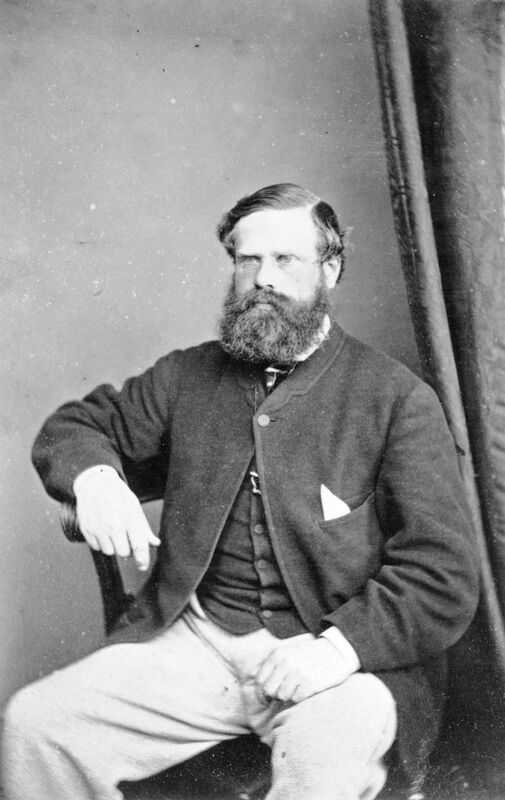 When Herbert appeared in Oamaru, he lived up to the family reputation for witty speaking. In 1867 he was induced to represent Oamaru in the Provincial Council, but the next year became insolvent and resigned with a shortness of notice that was severely criticised; by the end of May he died. The Julius brothers in Oamaru were given nicknames, Herbert's was "the Talking Julius"
Julius Herbert: Res - Waitaki. Ward - Jetty. Qual - Freehold. Julius Herbert: Residence-Waitaki; Ward-Jetty; Section 6; Block 27. 11th Dec 1867 pg 261 - Herbert applied for an Auctioneers Licence. Herbert Amelius Julius was a run holder in North Otago (not correct? ), and prominant figure on the Turf being Clerk of the Course at the Oamaru Jockey Club. In 1867 he was elected to represent Oamaru Town in the Otago Provincial Council. His death occured on 31 May 1868. Ref NZ Biographies NZSOG Auckland. The Oamaru Times, and Waitaki Reporter Friday, June 21, 1867. A meeting of the members of the Oamaru Jockey Club took place in the Star and Garter Hotel, on Tuesday afternoon last, Capt. Godfrey in the chair. The object was to consider what action should be taken relative to the fencing and leasing of the Reserve. . . . . Proposed by Mr H. A. Julius, and seconded by Mr Luke, " That tenders be called for immediately for fencing the Oamaru Race Course Reserve, . . . . . "Proposed by Mr Edric A. Julius, and seconded by Mr Connell, "That immediately upon the Club being in a position to give a good title, tenders be called for leasing the Race Course"
agency: DAAC. Series: 18116. Accession. D256. Box/item. 525. Record 47. Herbert Amelius Julius was elected Member of the Otago Provincial Council for the District of Oamaru (Town District) 1867, return of writs was published by the Colonial Secretary's Office Wellington the 26th April 1867. In the Supreme Court of New Zealand Otago and Southland District. It Is Hereby Notified to all to whom it may concern that Herbert Amelius Julius, of Oamaru, in the Province of Otago, and Colony of New Zealand, has this day caused to be filed in the Office of the Registrar, a Declaration of Insolvency. Dated this 24th day of April one thousand eight hundred and sixty eight. Solicitors for the said Herbert Amelius Julius. Herberts statements of his affairs record him with debts of L527.12, mostly to small creditors, and assets (shares) valued at L95. With the note: Resigned April 24; was re-elected, May 6; took his seat, May 8; Died May 31. Herbert resigned presumably because of his bankruptcy, but retained the confidence of his Oamaru Town electorate before dying of peritonitis. The Superintendant has to intimate to the Provincial Council that he has this day issued a writ for the election of a member of the Council for Oamaru Town, in the room of Herbert Amelius Julius, Esquire, resigned, returnable in fourteen days. The Superintendant forwards herewith for the information of the Provincial Council a writ issued by him upon the 24th Day of April last for the election of a person to serve as Member for the Town of Oamaru District in place of Herbert Amelius Julius Esq., resigned, with an endorsement thereon by the Returning Officer, dated 6th May 1868 to the effect that the said Herbert Amelius Julius has been duly elected to serve as Member of the Provincial Council for the said District. On motion of the Provincial Secretary and Treasurer, the House adjourned till seven oclock pm the following day. The letter above in the Minutes was edged in black. Ref Hocken Library Dunedin 2008. Inscription: In memory of Herbert Amelius Julius eldest son of George Charles Julius of Richmond Surrey born 4 Nov 1830 died 31 May 1868. An arched headstone in Oamaru stone. Letters of Administration were filed for Probate in Dunedin 3 August 1869 for Herbert Amelius Julius Gent of Waitaki and Dunedin. Agency: DAAC. Series: 9074. Accession: D239. Box/item. 243 Record. A714. Herbert's death certificate (NZ BDM folio 1868/599 Ref 80059869) described him as a "Flock owner" aged 37yrs. The cause of death was, what is now termed an appendicitis, no cure was available in 1868. The first successful surgery for the condition, took place in England in 1885. 1. Census: England, 30 Mar 1851, Wakefield Yorkshire. Herbert is recorded as a son unmarried aged 20 a solicitor articled clerk born Richmond Surrey.